We hear you. That's why Green House Data simplifies IT Operations through automation, extends teams with managed services, enables cloud platforms, and delivers advisory consulting to enterprises on every step of their IT journey. 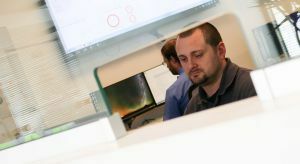 Founded in 2007, Green House Data started out with a simple mission: provide the high-availability and raw power, virtual infrastructure, and connectivity needed for critical business infrastructure while remaining a transparent, responsibly run company. Yet, as our client list evolved, so did we, adding locations, services, and ultimately evolving to a platform agnostic managed services provider who delivers hybrid solutions to enterprises who need secure IT environments and efficient management of their critical applications and business data. In 2018 we merged with Infront Consulting Group adding a deep bench of Microsoft experts and a complete enterprise advisory service suite for Azure and desktop automation, DevOps enablement, and IT modernization. Infront has been recognized 7 times as a Microsoft Partner of the Year, and values customer focus and breakthrough thinking to achieve better outcomes for their clients. We’re proud to have some of the best architects, consultants, MVPs, and engineers around, all focused on keeping your IT running smoothly. We take our 100% uptime SLA seriously, and constantly monitor all of our sites. When we say Built right. Just for you, we’re talking about more than just custom infrastructure or software development. This mantra drives every action across every department. If it doesn’t benefit the customer, forget it. And, we created a 15-Minute Hear from a Human SLA, so if there ever is a problem, our customers are not left waiting. Slow is the new down, and we know it. Whether it is IaaS, SaaS, traditional colocation, or a hybrid solution, we got our start in IT infrastructure and understand the impact of latency, downtime, and lagging systems. We've always offered 5% of our compute space and employee time to non-profits, and in 2014, Green House Data became a B-Corp so we could even better hold ourselves accountable to the environment, our staff, our shareholders, and the community around us. Every employee knows the financial status and growth strategy of the company. Everyone—from our top executives to our newest employee—is encouraged to volunteer and provide services to non-profits. And of course, there’s our dedication to energy-efficiency and green power, too. Want to learn more about our culture? Read about our leadership team, hit the blog for our latest thoughts and industry news, or apply to come work with us.